Compact Laser is the brand name of a Soft laser product owned by a thirty years old manufacturing Co.
Based at Vienna, Austria ( European Union ) named "Silberbauer Austria"
Same product with same brand name is introduced in India now by "Silberbauer India" . now popularly known as my laser !!! 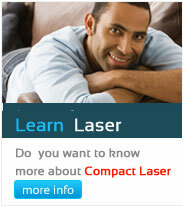 Almost all the study and research so far indicated on this website, is based upon the application of my laser !!! By those, the highly qualified end-users in India.